One quick glance at these ingredients and it’s clear to see that Red Sky contains a lot of stimulants. More importantly, it contains a lot of dangerous stimulants, including synephrine and sanegalia berlandieri, which contains a variety of risky substances, like DMHA. To start, these powerful stimulants are likely to boost energy and some research has found them to be beneficial for weight loss, but not without a cost. In other words, Red Sky may function like a strong energy booster, but the risks of taking it far outweigh any benefits (not proven) that it may provide. The caffeine in this product alone is high, with 300 mg per serving. This is about equivalent to 3 cups of coffee. On top of that, it adds synephrine (a caffeine catalyst) to the mix as well as other stimulant ingredients including higenamine, halostachine, and sanegalia berlandieri. Some of these stimulants, particularly those that can be extracted from senegalia berlandieri, are banned in other forms. The reason is that they have been linked to seriously cardiovascular effects, such as increased blood pressure, racing heart, heart attacks and strokes. The risks of these side effects are increased when combined with other stimulants like synephrine. 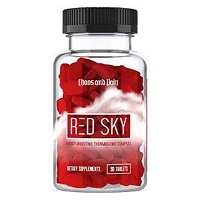 Other side effects that may be experienced when taking Red Sky Quick Release Thermogenic include, but are not necessarily limited to: sleeping difficulties, jitters, stomach problems, headaches, heart palpitations, vomiting, dizziness, anxiety and so on. Needless to say, Red Sky Quick Release Thermogenic is not a safe or reputable diet pill. It contains questionable and dangerous ingredients that have been linked to serious and deadly side effects. This product should be avoided.